Addameer's field researcher and human rights defender Salah Hamouri has had a previously issued administrative detention order reinstated after the Israeli High Court accepted the prosecutor's appeal not to reissue a three-month sentence (the remainder of his former sentence from when he was released in the 2011 Wafa al-Ahrar prisoner exchange). Hamouri was initially given an administrative detention for six months on 23 August 2017. On the day of the order's confirmation hearing, 5 September 2017, the Jerusalem District Court decided to instead make Salah complete the remaining time on a previously issued sentence from 2005. The Israeli prosecution appealed the judge's decision and a court hearing was scheduled on 12 September 2017. On 13 September 2017, the Israeli High Court ruled in favor of the prosecutor's appeal and ordered Hamouri to be placed under administrative detention for six months. A confirmation hearing for the new administrative detention order will be held on Sunday, 17 September 2017. Salah Hamouri, 32, is a Palestinian-French dual citizen and former Palestinian prisoner in Israeli jails. He was released in Wafa al-Ahrar exchange deal in 2011 after spending seven years in Israeli occupation prisons. In addition, he was banned from entering the West Bank by an Israeli military order until September 2016, and his wife Elsa Lefort is currently banned from entering Palestine. Addameer strongly condemns the Court's decision, which is part of a systematic policy of detaining human rights defenders, politicians, activists and civil society leaders under administrative detention, with no charge or trial. This policy is being used as an attempt to suppress Palestinian resistance through the arbitrary detention of those who resist the occupation through the path of human rights and political action. This arrest and decision is but one in a list of many, where the occupying power has attempted to stifle the legitimate pursuit of Palestinian human rights and basic dignity. For those who dare to speak up against this oppressive colonial regime, arbitrary detainment awaits. Addameer Prisoner Support and Human Rights Association reiterates its call for Hamouri's immediate release, as his detention constitutes an attack on Palestinian human rights defenders. Addameer considers administrative detention to be a form of arbitrary detention which amounts to psychological torture. As a result of being held indefinitely without charge or trial, the detainee may develop a psychological disorder, long-term depression, and chronic anxiety associated with the element of unpredictability. This practice of arbitrary detention is a grave violation of international laws and human rights standards, particularly articles 78 and 72 of the Fourth Geneva Convention which state that an accused individual has the right to defend himself. This also violates article 66 of the Fourth Geneva Convention and the basic standards of fair trial. 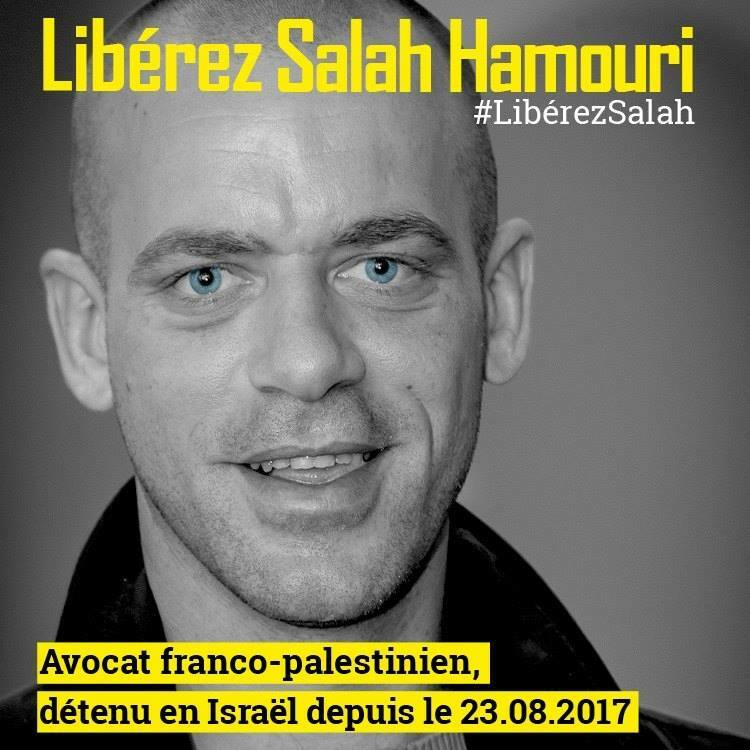 Organizations, activists, and parliamentarians across France are mobilizing to demand Hamouri's freedom once again.Take action now and demand Israeli officials to immediately release Salah Hamouri.